Skou studied medicine at the University of Copenhagen. The time he spent there was influenced by both the German occupation and the Danish resistance. Skou’s experiences included the seizure of his birthplace, the execution of a fellow student, and a number of his lecturers going underground. Fearing the occupying power, Skou and the other medical students took the Hippocratic oath one by one at a secret location remote from the university in 1944. His subsequent internship at a hospital in the North Jutland town of Hjørring was also affected by the war. The young Skou therefore quickly learned to perform minor operations so that the senior surgeon could leave the hospital and take part in gathering up weapons that had been dropped for the resistance movement. It was in Hjørring that Skou became seriously interested in surgery, but progress to a senior position in this field required a doctorate. In 1947, Skou therefore took a job at the Orthopaedic Hospital in Aarhus, where he planned to write his doctoral dissertation on the mechanism behind the effect of local anaesthetics. However, he soon moved on when he was given a position at the Department of Physiology at Aarhus University, where he continued his studies. At this time, with a history of only 19 years, Aarhus University was a very young institution and the research environment was correspondingly limited. Apart from Professor Søren L. Ørskov and Skou himself, the department consisted of two other young doctors. These four researchers jointly lectured the approximately 140 medical students who were enrolled each year. Skou’s research therefore advanced slowly, but he nevertheless became caught up in his scientific work and summer 1953 was a turning point, when he had the opportunity to visit Professor Nachmansohn from Columbia University. Nachmansohn spent the whole summer at the Marine Biological Laboratory in Woods Hole. This was a hub for neurophysiology because of the easy access to squid and thereby experiments with enormous nerves that could not be comparably studied in other animals. Skou’s period at Woods Hole was a significant experience for him. He suddenly found himself in an international research environment occupied by personalities whose names he otherwise only knew from textbooks and journals. Jens Christian Skou completed his medical doctorate in 1954, and his dissertation was published in Danish under the title Lokalanæstetika (Local anaesthetics). At home in Aarhus, however, the newly graduated doctor did not have access to nerves from squid, and he therefore decided to use nerves from crabs instead. Crab nerves have the same properties as squid nerves because they also contain a protein substance with a high level of enzymatic activity. Unfortunately, however, they are not the same size – so a considerable number of crabs had to be used. Skou made an agreement with a fisherman from Norsminde and, in the following years, a distinct odour permeated the Department of Physiology in Aarhus, where approximately 20–25 000 crabs had to be boiled so the fresh, threadlike nerve fibres could be studied. These were the studies that led to Skou’s description of the sodium-potassium pump: an ion-transporting enzyme (Na,K-ATPase) that maintains the balance between sodium ions (Na + ) and potassium ions (K + ) in the cells. Skou did not initially use the term 'pump' about the enzyme, but in 1957 he published his research in the Biochimica et Biophysica Acta journal under the heading The influence of some cations on an adenosine triphosphatase from peripheral nerves. This was the article that 40 years later earned him the Nobel Prize. 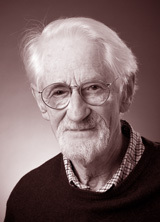 In 1963, Jens Christian Skou was appointed professor at the Department of Physiology. His identification of the sodium-potassium pump attracted attention to the department, and on an international scale, Aarhus University became one of the centres of expertise in transport across the cell membrane during the 1960s – a position the university still holds today. During Skou’s period as professor, the department underwent sweeping development, and in the course of a few years, the number of staff members increased from four to approximately 25. Skou himself continued to carry out research into the structure and function of the active transport system in the cells and established numerous international connections. Skou retired in 1988, but when he was awarded the Nobel Prize in Chemistry in 1997, he still spent his days at his office at the university and still spent a lot of time researching. He has been awarded the Eric K. Fernström Foundation’s Nordic Prize, the Leo Award, the Novo Award, Consul Carlsen’s Award, and the Anders Retzius Medal. He is a member of the Royal Danish Academy of Sciences and Letters, the European Molecular Biology Organization (EMBO) and the National Academy of Sciences, USA.